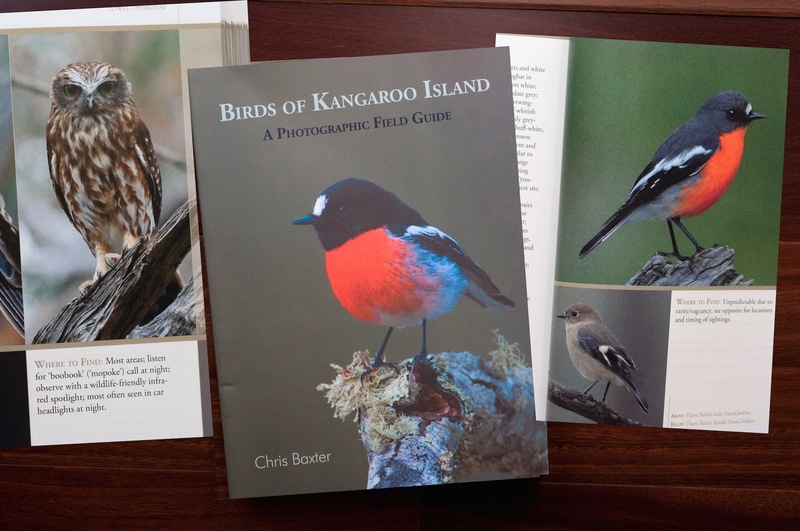 The Birds of Kangaroo Island A Photographic Field Guide. A little bit chuffed with myself. This lovely book turned up in the mail today. A beautifully laid out book, with each bird to a spread and a page of photos. The Text from Chris Baxter shows a labour of love and really interesting insights into each bird. I’m pretty excited as several of my shots are used to illustrate the birds. My real pride and joy of course is the Southern Boobook which was on Flickr in October 2014. It’s a good field guide to many other areas and will be get lots of use when we are working with waders. There is also a radio interview with Chris Baxter on the site as well. Radio interview with Chris Baxter by Ian Henschke of the ‘Morning Program’ on Adelaide ABC Local Radio 891, Friday 15 May 2015. Many congratulations David! The books looks beautifully done. Congratulations…It must be exciting to see your birds in print. Many congratulations David – that’s great news, you must be proud. it’s always nice to get a bit of recognition and to see your work in print like this must be very satisfying.